Providence Financial Advisors, LLC believes it is important to have balance between growing your assets and protecting your wealth. We take a long term approach to investing, avoiding fads and market timing. To accomplish this, portfolios are designed using Modern Portfolio Theory. The portfolio is invested utilizing no load and institutional class mutual funds, Exchange Traded Funds (ETF) and on a limited basis, individual securities in your portfolio. Once your portfolio is invested, it is continually monitored against your investment objectives and goals. You are kept up to date through quarterly reports, emails, telephone calls and in person meetings. As a fee only, independent advisor, you can be assured that the investments we utilize in your account are there because they meet a specific investment criterion, not because they pay the largest commission. Having a plan that addresses your goals and investment risk tolerance is paramount to success. Providence Financial Advisors, LLC will help you put together a plan that helps you address these issues. Our plans are designed to help focus your goals for retirement, education, wealth transfer, and charitable giving, just to name a few. These plans are seen as a work in progress and are periodically reviewed and updated as your situation changes. 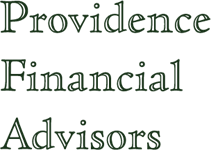 Providence Financial Advisors, LLC believes it is important that all of your professional advisors are working together towards your goals. As part of our service, we will work with your tax, legal and insurance professionals to ensure this is the case. If you do not have expertise available to you in these areas, PFA has developed strategic alliances with professionals to help meet your needs.